What is the Green Line? The Green Line was the first of six monorail lines that had been planned for a monorail rapid-transit system in Seattle. Where Would the Green Line Have Gone? What was the Project Schedule? In Summer of 2005 a tentative agreement was reached to design, build, operate, and maintain the Green Line. The line was scheduled to open to passenger service in 2010.
Who Was to Build the Green Line? Cascadia Monorail Company, LLC was a team including Hitachi as the train manufacturer. 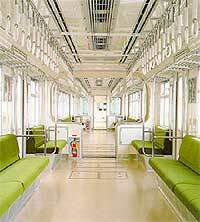 for the Green Line trains. Team Monorail was a team including Bombardier as the train manufacturer. Team Monorail announced in August 2004 that they will not bid, leaving Cascadia Monorail as the only bidder. It was with Cascadia that the SMP reached an agreement. However the financing scheme was not satisfactory, and the resulting controversy ended on 8 November 2005 when Seattle voters voted 2 to 1 in favor of building no monorail.